Recipe for a President: take one part intelligence and mix with two parts charisma, two parts passion, one part humility, and a dash of eloquence; sprinkle with laugh lines, wrap it in wit, and serve warm with a smile for the camera. We want our leader to be equally adept at both foreign policy and cracking one-liners, balancing the budget while playing pick-up basketball games with the White House staff. No matter the situation, the Leader of the Free World is expected to be talented and unflappable – in short, the President is expected to be Jed Bartlet. One of the more lasting creations of Hollywood wunderkind Aaron Sorkin, Bartlet was a character on the award-winning television program The West Wing (1999-2006). As the show followed the lives of President Bartlet and his staff during their eight years in office, America learned all about the inner-workings of the Executive Branch, from how elections work to how laws are made. Despite terrorist attacks, assassination attempts, and treasonous scandals, the political powerhouse of Jed Bartlet still managed to fix Social Security, negotiate peace between Israel and Palestine, and get re-elected – all while warming the hearts of the viewing public with his intellectual sense of humor. We’ve seen the ideal person to sit in the Oval Office – the trick now is finding a real person who can measure up, right? Oh, how the sarcasm burns. Obviously, the drama of The West Wing made for good television, but that came largely in spite of, rather than because of, its subject matter – a fact that has only helped to motivate the widespread ignorance throughout the Fifty States of just how Washington works. With the President at the center of the show’s focus, everything else about the federal government fell to the periphery; Bartlet was a main character, so congressmen, justices, cabinet members, and the rest became merely supporting roles in the hierarchy. Every week, America tuned in to see what the President and his team would do next to save the country – cleverly joking all the way. A problem immediately presents itself: this is not how the American government actually works. On one level, simple inaccuracies in procedure and function are reinforced by Hollywood depictions of the President as the main character in politics. For example, the President neither creates policy nor passes laws, so the fifth-season storyline concerning Bartlet’s maneuverings around Social Security is, at the very least, misleading – especially since it is never revealed whether or not the fictional Congress approves the plan. Americans who took Sorkin’s drama as a step away from documentary came away with a sorely one-sided view of Washington that fundamentally misunderstands the idea of the separation of governmental powers. Moreover, the dream of finding such a perfect candidate for the presidency is beyond unrealistic. No nominee has a team of writers crafting every conversation that happens in front of the cameras so as to allow for just the right mixture of wit and wisdom to lead into the commercial break. Real candidates are real people – they make mistakes, tell jokes that fall flat, lose key debates, and – in a word – fail. 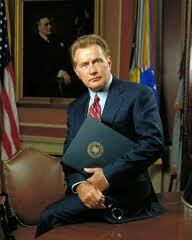 And yet, doesn’t President Obama strike a chord of familiarity with the things that we once saw in Bartlet? Relaxed and collected, we currently have a President who can present a great sounding speech before singing at a blues concert with Jagger and B.B. King. In between foreign policy meetings, we can get updates from O via Twitter and while comparing our NCAA championship bracket to his to see how we compete. In interviews, press meetings, and even the State of the Union address, the President seems to be going out of his way to appear witty, likeable, and above reproach. And, on top of it all, President Obama has done more to shake the foundations of the separation of powers than any other person in the last sixty years. The Sorkin Effect – this terrible idea that the President must be perpetually entertaining – has infected the minds of not only voters, but also now the Oval Office itself. The point of the presidency is not to put on a show, making the country laugh while it feels safe and warm; it is to speak truth and represent the country with excellence. No more or less important than any other branch, the executive arm of Washington should not simply be a figurehead dancing to distract the people. As Christians called to focus on whatever is true, honorable, just, pure, lovely, and commendable (Phil. 4:8), we would do well to keep in mind that our culture’s obsession with amusement is fleeting at best. As the day draws near to select (or re-select) our President, we must remember that true leadership is more about telling us what we need to hear, not simply giving us what we want to see.